These crunchy mini phyllo cups make wonderful appetizers because they can be filled with a variety of flavours and textures. They take no time to make and look elegant on any serving tray. Phyllo cups can be made a couple of days in advance, just keep them stored in an air tight container. 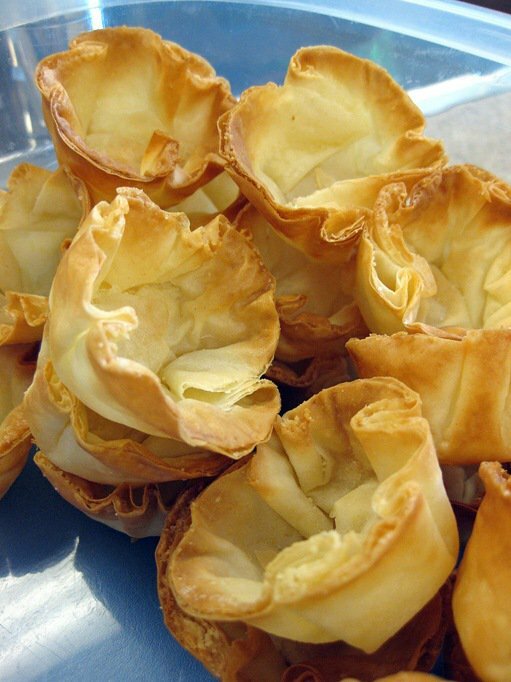 What you fill these phyllo cups with is only limited by your imagination. Think both savoury and sweet! One of my favourite fillings is this savoury mushroom and onions mixture, scented with thyme and topped with delicious Gruyere cheese. Make lots of these....they will disappear quickly! Enjoy! 1. Preheat your oven to 375 F. Lightly grease a 24 mini muffin tin and set aside. 2. Place 1 sheet of phyllo on clean work surface, keeping remaining phyllo covered with a damp tea towel. Brush the entire sheet lightly with butter. Top with second sheet and again brush with butter. Top with third sheet and again brush with butter. 3. Cut sheets lengthwise into 4 strips and crosswise into 6 strips to make 24 squares. 4. Press the squares into each prepared mini muffin cup. The sheets will hang over the top. 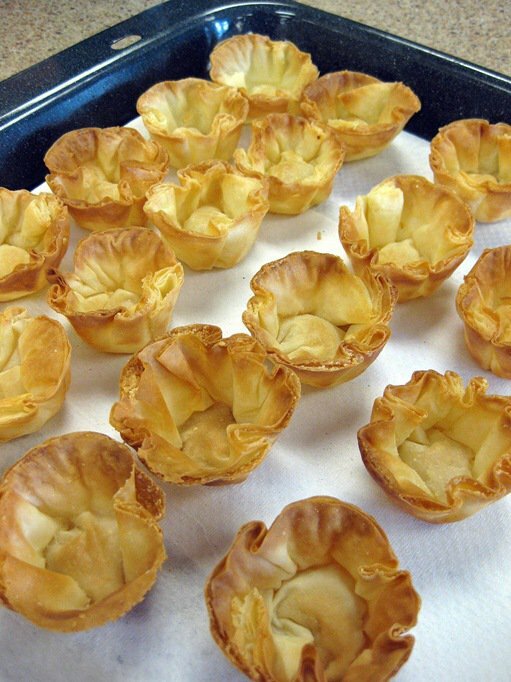 Bake the phyllo cups in the centre of your oven for about 4-6 minutes or until they are golden. 5. Let the cups cool in the pan on a rack. 1. Melt butter with oil in large deep skillet over medium-high heat. Add the mushrooms and saute until tender and browned, stirring often, about 10 minutes. 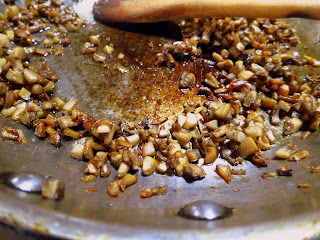 Add the shallots, thyme and balsamic vinegar; saute until tender, about 2 minutes. 2. Add broth and simmer 1 minute. Stir in the sour cream and warm through. Season mushroom mixture to taste with salt and pepper. Remove from heat; cover to keep warm. 3. 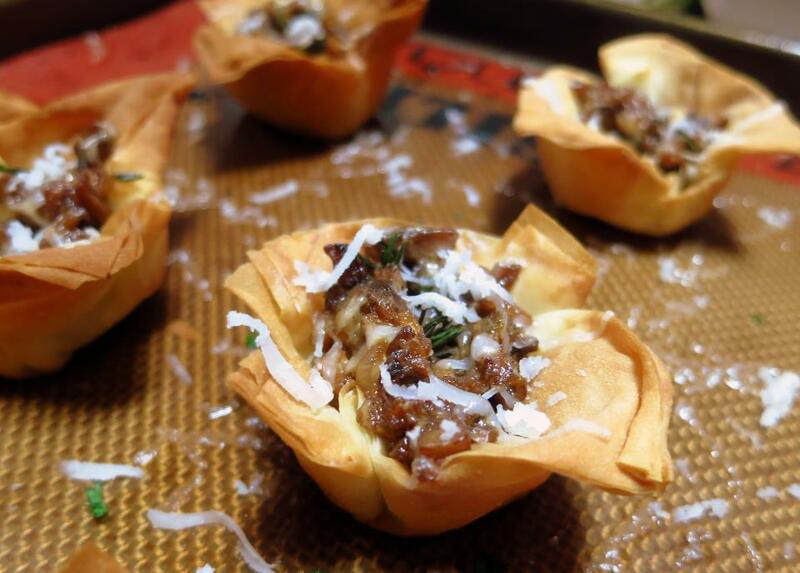 Fill each phyllo cup with warm mushroom mixture. Sprinkle with grated cheese and top with a few thyme leaves. Bake 3-4 minutes or until cheese is melted and filling is thoroughly heated. Serve warm.